The VACVINA biogas model, designed by CRRD, was recognized by MARD who decreed that it could be installed nationwide. CCRD promoted biogas technology through the local network of VACVINA offices. The VACVINA provincial chapter is responsible for continuous monitoring and support at commune level, supervised at district branch level. Supervised by the provincial chapter, district chapters are responsible for monitoring suppliers and managing credit for commune level providers. Biogas service providers take responsibility for the sale, construction and installation of turn-key bio-digesters, training clients and honouring the warranty to households and farmers. The system consists of a digestion tank (septic tank), nylon reservoir bag and inlet, outlet systems. The digestion tank is a flat-top rectangular underground digestion chamber. The external plastic gas reservoir is made of two to three layers of nylon bag. An ingenious system of inlet siphon allows the new material to be dropped into the surface of the fermenting liquid thus breaking any accumulated scum. The small outlet tank collect liquid waste from the digestion tank through a plastic tube. The main digester is an underground rectangular tank made of bricks and mortar. However, the shape of the tank can be adjusted to the specific configuration and constraints of the family compound while retaining a sufficient volume. One of the great advantages of this model is that the concrete flat top of the digester can provide a clean and dry floor for the pigsty or stable. 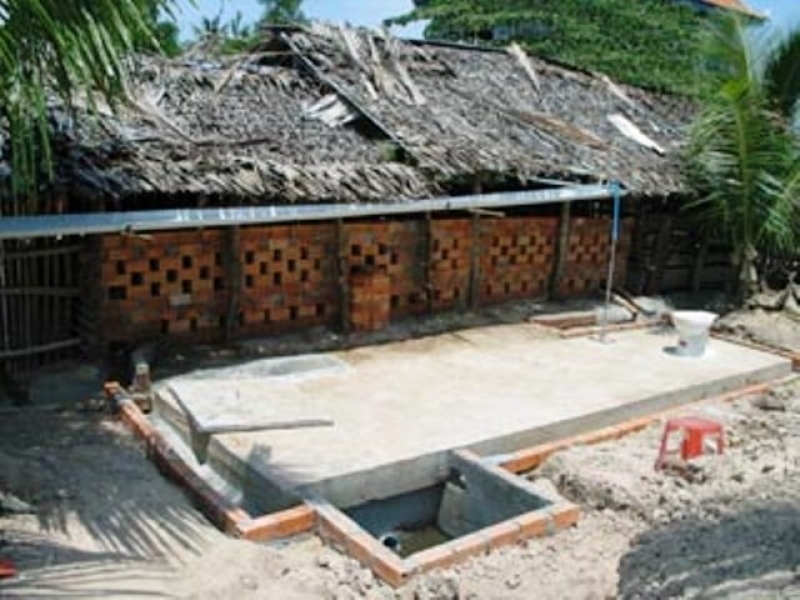 It also can be build as an integration of the toilet and the septic tank under the stable. The hole for the inlet pipe is 30cm diameter and starts from the top of the wall. It can be located on any wall of the digestion tank during the construction time. A siphon connect the mixing tank and the main digestion tank. The standard dimensions of the mixing tank are 0.2 m x 0.4 m with a depth of 0.3 m. This system prevents the formation of a scum layer by regularly wetting and mixing the surface with fresh input.